MED-DESIRE photo flashmob: switch off the waste, turn on clean energy! Switch off the waste, turn on clean energy! 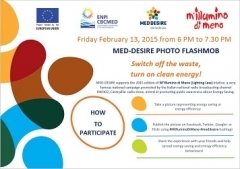 On Februay 13 from 6.00 PM to 7.30 PM take part to MED-DESIRE PHOTO FLASHMOB: you can participate in three simple steps. 3. Share the experience with your friend and help spread energy saving and energy efficiency behaviours! Through the photo flashmob, MED-DESIRE supports the 2015 edition of M’Illumino di Meno (Lighting Less) iniative, a very famous national campaign promoted by the Italian national radio broadcasting channel RADIO2, Caterpillar radio show, aimed at promoting public awareness about Energy Saving.